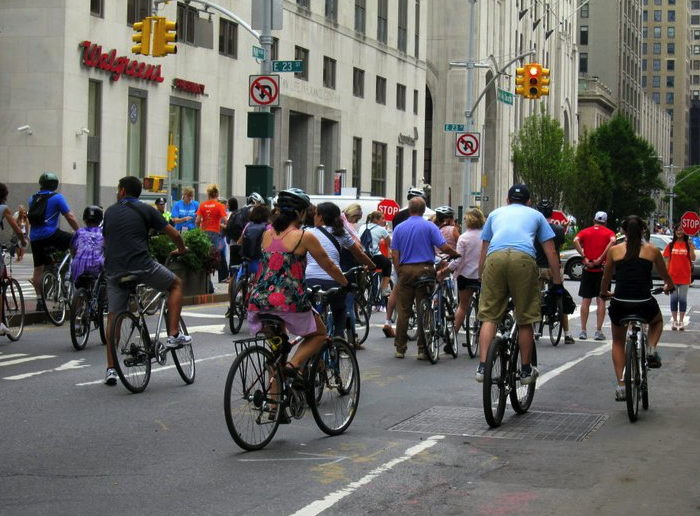 All Summer, the New York City Department of Transportation has been giving away free helmets, bicycle lessons, and safety tips in support of biking your way through NYC. This month, NYC DOT produced Summer Streets, an event where Park Avenue was closed down and made available only to pedestrians, cyclists, rollerbladers, and others on all types of wheels whether they be scooters or skateboards. No cars! 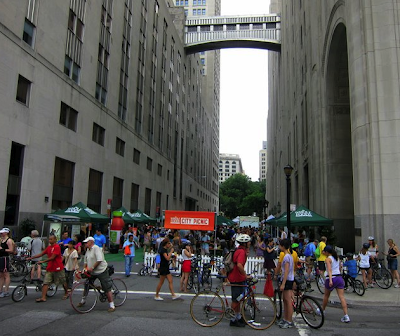 2011 was Summer Streets' fourth year of existence. The event happened over a course of three weekends. I was lucky and motivated enough to attend two Saturdays of Summer Streets. My primary focus of Summer Streets was biking. It can be a struggle at times to bike through the city. There are pockets of NYC, such as Chinatown, where the cars are so dominant that cyclists can be pushed aside, sideswiped, and hit in a matter of seconds. Of course, this can really happen anywhere but biking through some areas of the city are more dangerous than others. To be able to fly up and down Park Avenue all the way from downtown up to Central Park with ease is really a luxury. At times, it even felt exhilarating. 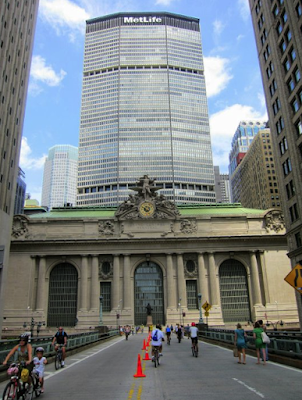 We were even allowed to race through the MetLife building, a path normally meant for cars only. 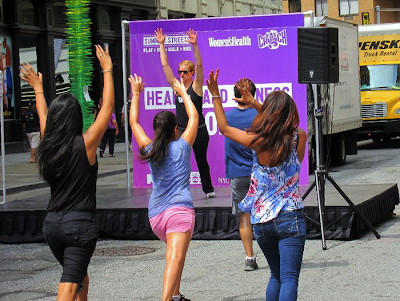 There were many activities at Summer Streets. Those who were not into biking or just needed a workout could join one of the many aerobic classes available. 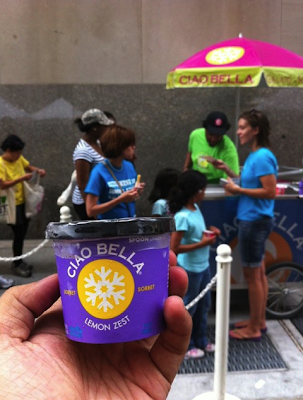 At 23rd Street, there was a picnic rest area where many sponsors gave away treats and samples. Cheese, smoothies, yogurt, milk, tea, gelato, sorbet, trail mix bars, you name it, they gave it. I enjoyed the giveaways but really just wanted to bike. The rest area even had a bike valet just in case you did not have a lock. We did two different paths at each Summer Street. The first week we ventured off of Park Avenue and into Central Park where we did the short loop. The second week we skipped the park and proceeded downtown to Chinatown where we took a break for lunch. We bought food from different restaurants and ate on benches at Columbus Park. There were many interesting sights along the way. 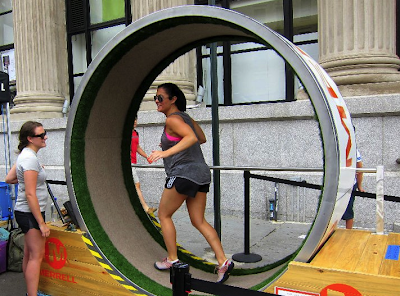 The one I was looking for the whole time was the human hamster wheel. The other one that really caught my attention was the sand castle by Travel Channel's Sand Masters. The Brooklyn Bridge crumbled seconds later. Summer Streets lasted from 7AM to 1PM for three Saturdays in the month of August. I am definitely looking forward to riding it again next year. The streets were calm and the city was all ours. Oink, we did it again. Intentionally. 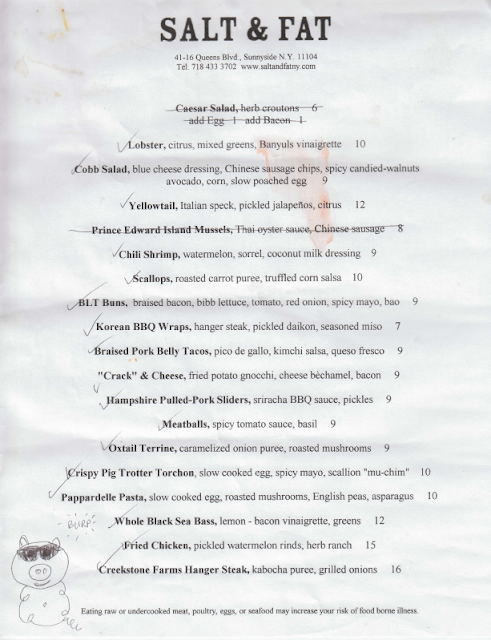 My friends and I (consisting of two chefs, a bartender, two pork enthusiasts, and someone with a bottomless pit) went back to Salt & Fat to order the whole menu. It was planned and we conquered. Surprisingly, everything was better than the last time with a few twists and turns and new dishes to boast. The servings also got bigger. Price stayed the same. Highlights on the new items were the Chili Shrimp, Scallops, and Crispy Pig Trotter Torchon. The chili shrimp sat on cubes of watermelon. Oh man I am loving the use of watermelon in dishes. It's quite refreshing. The Crispy Pig Trotter Torchon was like a crabcake but bigger and full of pork. The scallops were sweet and came with a corn salsa. The quality and presentation of the small plates at Salt & Fat are really impressive. Oh how I love Queens and Salt & Fat for keeping everything affordable. For the staples, the "Crack" & Cheese and Hanger Steak was much improved. The gnocchi wasn't dry and the steak was juicier and more rare. The Fried Chicken was heavenly and the Pulled Pork Sliders and Korean BBQ Wraps were tied for favorites. The biggest surprise for me was dessert. We got one of each. The last time we went, I remembered the dessert to be bad. This time, it was good. The rice krispie was fresh, not frozen, and soft and gooey. The marshmallow ice cream was amazing as well as the avocado flavored one. We found the yuzu sorbet super tart. The Lime Panna Cotta was delish and we topped everything off with our own homemade Basque cake. The waitress even dug in. We kept a copy of the menu to make notes. As you can see it is stained with sauce and commemorated with piggy. How. Very. Appropriate. And telling of the meal. Oink! Celebrity Sightings: They're Real People Too. It's amazing who you see when you keep your eyes open. I have a tendency to let celebrities go unrecognized but lately I've been doing good and spotting them. -Jason Derulo was walking down 5th Avenue with two of his homeboys. His friends were dressed much nicer than him in suit vests. Jason was blinged out and pretty casual in nice jeans. The three of them were pretty low key but their dress made them stand out. No one bothered with them, just one foreign tourist who took a picture with Jason with her cell phone. Jason actually looked lost on 5th Avenue. He kept looking around and actually he didn't look very interested in the stores. I wondered if he would have felt more comfortable on 34th Street at a Foot Locker. -Anne Hathaway was holding on to the subway pole on the L train. A flamboyant gay guy exited at Bedford, turned around, and gave her an Academy Award speech, "Thank you. Thank you so much for the work you do. You do such beautiful work. I am such a fan of yours, etc." I was listening to my iPod and was a little confused as to what was going on. At first I thought she was some sort of MAC cosmetic artist since she was dressed in all black. I looked at her face and recognized her. I WAS TAKING THE TRAIN WITH ANNE HATHAWAY! I debated asking to take a picture with her or taking a picture of her but I decided to leave her alone. She looked uncomfortable with the attention and tried to deflect it. She was with her boyfriend and then they preceded to canoodle on the train. I went back to sleep. When I got off at the Lorimer stop, they got off as well. I think the boyfriend lives in Brooklyn. We parted ways at the turn style. Everyone's reaction to this sighting is, "She takes the subway?!" Yes. She's just like you and me. Meatopia! There were over 40 restaurants with booths and we got through not nearly enough! There was just too much to eat! If you are contemplating if Meatopia is worth the hefty ticket prices upwards of $80, absolutely yes! There were no lines for food, there was plenty of food, the food was of high quality and beautiful presentation, you got to get up close and personal with the chefs (all of which have celebrity status IMO), portions were of ample size, restaurants were quite established, and there were lots of free bonuses. I drank more than a gallon of Fiji water and had a serving or two of Capogiro gelato. Stay tuned for blog post #3 of this event. Sweetopia! In the meantime, here are a few gems from Meatopia 2011. I would post pictures of the rest, but I forgot to take them. I was too busy tasting the food. Sometimes I'm just so overwhelmed living in the moment that I forget to capture it on digital. If only I could let you peek into my memories. -The spicy veal taco from La Esquina made me excited to try out the new location in Williamsburg. Yes, it seems like everyone is moving to the burg. -The grilled chicken heart was definitely one of my top 3 bests at Meatopia. Thanks to @Stellaaa I've really grown to like hearts! They taste exactly like beef. -The short ribs and black truffles were out of this world. I went to La Bernadin and had the truffle tasting menu. I wasn't too crazy for it but Creekstone Farms did a great job with their truffle accents! Talk about gourmet! -Fossil Farms did a variety of sausages. Some tasted gamey as they were serving elk, duck, and wild boars of the like. All were very good with the pairings of chimichurri, scallion spreads, and sweet and sour onion relish. -Bar Basque had a whole tasting menu of Hampshire Hog seven ways. The highlight for me was the bacon ice cream. At first they were serving it in cones. They ran out quickly and I patiently waited about 10 minutes for the new batch of ice cream to soften. By then, they started serving it as chicharron ice cream sandwiches. Sometimes it's worth waiting. -Hot and Hot Fish Club had volunteer culinary students preparing the food. They did an excellent job with the recipe. The frisee salad that accompanied the elk crepinette was so refreshing. I loved the juicy clementines and the crunchy bites of almonds. -Amanda Freitag chose to work with chicken. She was literally sweaty and slaving over a hot grill. -The grilled duck on a paratha from The Hurricane Club was amazing and rich. The serving was so big, even split between two people. It conquered us. The duck was so tender. -Sheep heads. Every part of an animal was served at Meatopia. I had pig face, chicken hearts, beef ribs, etc. There was even a butcher contest going on. They don't call Meatopia Meatopia for nothing! I could go on and on about how Meatopia was really a meat heaven. I wish I could go back in time and relive the epic day. It wasn't just about the food. It was the setting and circumstances of how I found myself at Meatopia. Chillin' with the Manhattan skyline in the background... these moments just don't happen in California. For now, here's two pictures for what I like to refer to as a "meateaser" for my one day Meatopia post followed by a Sweetopia post. Yes, there were even cupcakes and marshmallows. Till then, rock on with ribeye. -The spicy lamb sloppy joe was not gamey and not very spicy, but it was delicious! I am actually a fan of all things Meatball Shop. -The sandwich from Waterfront Ale House was very good. Their mustard and pickles were homemade and gave a nice balance to the boar ham. The accompanying potato salad was excellent. While I was trying to just sample and not fill up, I actually killed all that potato salad. It was just too good to gloss over. Owner Sam Barbieri is a very friendly guy. He walked us through the smoker and wanted to chat for quite a bit. Needless to say, he's charismatic! I also found it amusing his chef uniform was labeled, "Fuhgeddaboutit". Very New York.